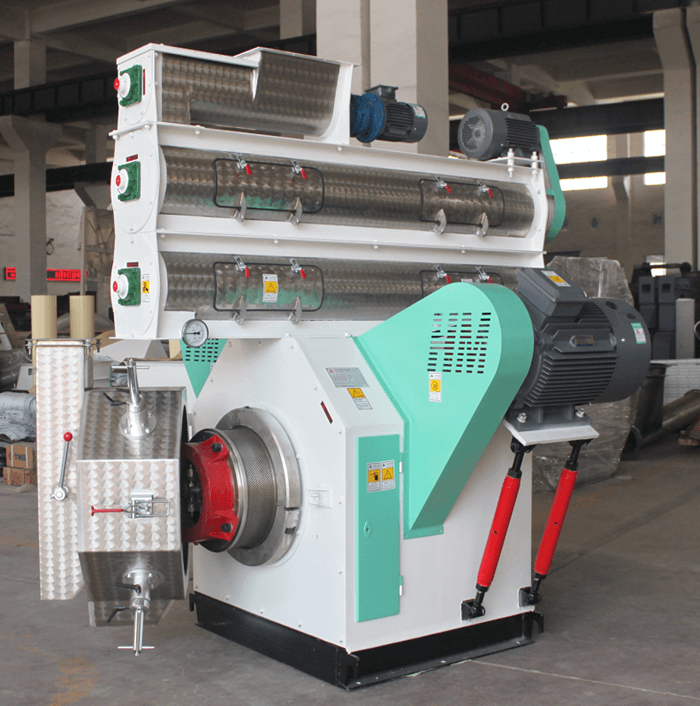 The use of pellet feed machinery equipment - Wuxi Huamu machinery Co.,LTD. The operation mode of pellet feed machinery is also crucial to the life span of the equipment. Check the connections of each site according to the rules of operation before use. Add a proper amount of clean lubricating oil to the running area. Check the circuit system to make sure it is working, troubleshooting and then only operate it. Steam boiler begins to boil water 1 ~ 2 hours before production, so that the steam reaches the required temperature and pressure. Replace the required ring die and adjust the clearance between the ring die and the shaft according to the production requirement. The operation sequence of each machine equipment is from the back to start. Open the delivery channel of grain feed or finished goods warehouse through a three-way or rotary distributor. Open the grading sieve, open the various transportation equipment accordingly, start the granule machine, start the cooler fan. Start the motor of granulating machine, after it operates normally, start conditioning, and start to feed the feeder, the speed of the feeder according to host the current situation of the motor to adjust gradually from low to high. Feed through the feeder into the regulator, adjust the vapor valve of the steam valve to enter the amount of steam, and the feed amount of the feeder should be appropriate, check the quality condition first, if not meet the requirement, then discharge it externally. Feed through the feeder into the regulator, adjust the vapor valve of the steam valve to enter the amount of steam, and the feed amount of the feeder should be appropriate, check the quality condition first, if not meet the requirement, the external discharge. At the end of the work, each machine should be stopped at a certain time in the order of the previous day. When the granule machine is started, the feeding quantity must be low speed to high speed. Do not start at high speed, causing the ring die and granule machine to be damaged by sudden overload or ring block material. When the granule machine is started, the feeding quantity must be from low speed to high speed. Do not start at high speed, it will cause the ring die and granule machine to be damaged by sudden overload or ring block material. 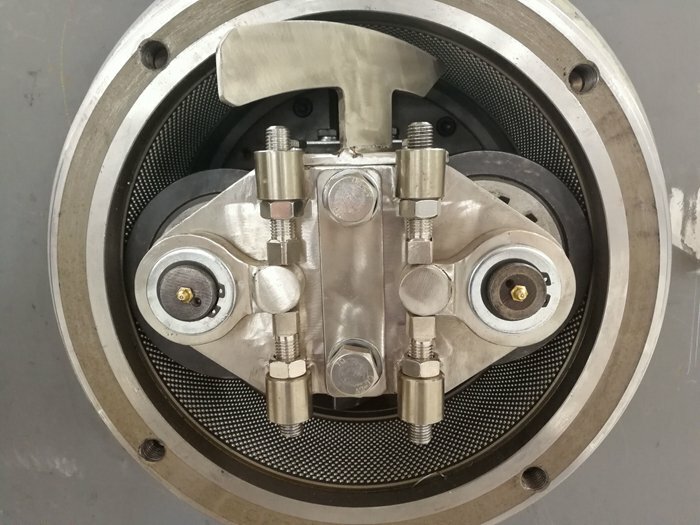 Pressure to use the new machine or new change of the ring die part should be processed with high fat content feed, make certain lubrication to the die, and then process the materials, which can prolong the service life of ring die. In the end of the work, add oil content powder, or oil soaked sawdust to fill the die hole to prevent rust. The cooling time for pellet feed is according to the grain diameter size, seasonal temperature, output size, etc., by adjusting the cooler of position of the switch to adjust up and down, ensure that particles of the cooler temperature is not higher than the environment temperature 5 ℃. Pay attention to the spacing between the two rollers and keep the parallel between the two rollers. Roller and ring die clearance must be controlled in 0.1 ~ 3.3 mm, don't let the eccentric roller in contact with the ring die surface or side clearance is too large, it is invisible to the naked eye and the size of the imperceptible when installation, lest cause ring die and roller wear or not discharge. When using grading sieve, we need to change up and down two layers mesh screen according to the requirement of granule feed, and the hole size of mesh hole is in the top and the hole is in the bottom. Each sieve needs holes in the top, large holes in the lower because the net is rubber ball. Add: No.18,Jingxiang Road,Xibei Town Wuxi ,Jiangsu Province,China.